Ahead of the proposed agitation against the Dholera Special Investment Region (DSIR) on March 29, the Gujarat police in the wee hours of March 26 arrested one of the senior farmer leaders of the area, Rajbha Chudasma. A statement issued by Jamin Adhikar Andolan Gujarat (JAAG), which organized the agitation, called arrest as smacking of “political pressure to suppress a non-political movement”. To be implemented in the south of Ahmedabad in 22 villages encompassing 900 sq km, DSIR has been envisaged as a modern industrial township in the Delhi-Mumbai Industrial Corridor (DMIC), but has invited farmers’ ire over Gujarat government decision to take away 50 per cent of the farmers’ land in the name of developing infrastructure. The letter wants Karwal to “find out where, why and from whom the orders for the arrest were given”. JAAG sources say, this is not for the first time that its leaders were tried to be browbeaten. On several occasions in the past, whenever they wished to go ahead with an agitation, the police swooped on them and arrested them. On February 9 this year, about 100 farmers, including leaders Chudasma, Rajbha Chudasma, Sagar Rabari and Lalji Desai and senior activist Indukumar Jani were detained for starting an agitation at Sandhila village in Dholera SIR. Dholera is not the only area where JAAG is being targeted. This has happened during its opposition to another special investment region (SIR), being planned in North Gujarat, too. On August 15, 2013, the police cancelled the permission granted for the flag hoisting at the last minute to the protesting villagers in the Mandal-Bechraji SIR area. On October 23, 2013 the permission for the cattle rally from Hansalpur to Gandhinagar was denied to the protesting Maldharis. And on January 18, 2014 the cattle rally by the maldharis was stopped by the police, they were beaten with lathis and had cases registered against them. 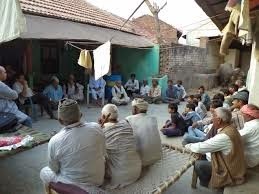 If in Dholera farmers want the SIR to be cancelled, even as demanding permanent cancellation of the order which seeks to decommand the Narmada command in 22 villages where the DSIR is being implemented, in Mandal-Bhechraji it is against Maruti, which has deprived poor farmers and cattle breeding maldharis of their land.